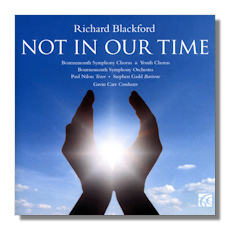 Not In Our Time is a fairly conventional (tonal) orchestral oratorio-style piece by British composer, Richard Blackford. He was born in 1954, studied composition with John Lambert at the Royal College of Music, conducting with Norman del Mar and was Henze's assistant (in Italy) for a while; there he became associated with the European avant-garde. His interests shifted towards dramatic "occasional" music. You won't find anything experimental or innovative in this piece, a setting of texts from a variety of sources… the sixth century hymn, "Vexilla Regis" to the belligerent utterings of George W. Bush after 9/11. Indeed, the point of Not In Our Time, written for the Bournmouth Symphony Orchestra on the anniversary of that event, is to commend the notion that few such pronouncements (on revenge, on the rightness of military action, on expansionism and defense) are really one-sided, self-evident, justifiable. Most effectively, Blackford's choice of texts and evocative compositional styles suggest something that is inevitable: that aggression, war, and "revenge" do result in suffering and death. At the heart of the work, Part 4, Tom Junod's "The Falling Man" depicts the horror of one of the many who chose to jump from the World Trade Center to their deaths. People always lose out to dogma. This is the longest (at just over six minutes) section in the work, which consists of 14 such small sections. Blackford's historical perspective is broad: he presents other Arab and Muslim reactions to western crusades against their civilizations – from the eleventh century onwards and the violent reactions by Muslim leaders. Most significantly, Blackford struggles with the apparent indifference of the Christian God he believes in and His non-intervention to stop suffering. The dynamic is less pacifist than was the case in Britten's War Requiem, say: the tenor takes the texts with origins or sentiments in the Christian tradition; the baritone those of Islam. The suggestion is that it's pointless to assume that there is no conflict and that peace can be arrived at in similar fashion by multiple protagonists. What's more, the chorus has several purposes: it acts as that of a Greek Chorus commenting on the action. The chorus is warriors; it is other protagonists inextricably involved in conflict and the ensuing losses – such as abandoned Arab children. At the same time, the texts so clearly and cleanly articulated by the two soloists, Paul Nilon (tenor) and Stephen Gadd (baritone), are not proselytizing ones. Nor is Blackford's tone provocative. There is as much of the music in its sweeps, orchestration and pace to be a work of art first and social comment second. The music is forceful in places, colorful and incisive if not really ever exploratory. It successfully unifies the flavors and imports of the many sources from which it draws its texts. It never overplays the rhetoric which has to be implied by the subject matter. Such sections as the fourteenth and last setting, Barrack Obama's address at Cairo University in 2009, for example, operate on the basis of a strictly one-to-one correspondence between monophonic syllabic exegesis and chordal accompaniment. Yet the work doesn't go the extra distance and use acidity to expose his hypocrisy in such pronouncements. By the same token, the words of Mohammed Ben Zekyin in his sermon in Jerusalem in 1187 in response to western invasion, cannot be heard at face value. There is implicit (though little musical) comment on the ironic consequences of all such pronouncements. Indeed, that's the import of the work's title – from Hilda Dolittle's poem, which is quoted at four points throughout the piece. It has to be said that Not In Our Time still has the feel of something unfinished, as much rumination as polished presentation. Although it begins with a flourish, it ends with what seems like inconclusive abrogation of musical responsibility… neither climax nor intentional anti-climax. The standard of playing is convincing and well up to what Blackford demands of conductor Gavin Carr and his forces. Yet there is just a little too much of the filmic, the illustrative, of the work, and not enough detached reflection. That some movements in the text (reproduced in the accompanying booklet, which also has useful background and bios etc) need (or at least carry) descriptions such as "Very soft, orchestral, introduction. Time and motion in a state of suspension" and "Orchestral march. Pounding war drums, blazing trumpets…" may worry some. Won't the music convey these attributes of its own accord? There is much in this piece to interest. It has as many strengths, perhaps, as weaknesses. As something a little out of the ordinary, though not musically extra-ordinary it's likely to find adherents. It's already aroused some interest – at the time of its first performance last September, for instance. But whether it will last in the repertoire of great commentaries on the relationship between music and society remains to be seen. If it's well-executed relatively large-scale choral music by a leading British orchestra you're after, this CD will not disappoint.